GDC Virtual reality reemerged in the past couple of years as a hot tech topic. However, the unfortunate truth – fiercely ignored by its passionate advocates – is that it hasn't been ready for primetime. That situation has changed this week at the 2018 Games Developers Conference (GDC) in San Francisco, USA. It's now looking as though the next generation of systems coming online might actually kickstart a whole new market, if they are ever released. It's not going to happen immediately – all the most-promising products at this tech summit have yet to hit the market – but pretty much every barrier to mainstream adoption has been solved by one of the companies in the Moscone Center's enormous rooms. It's just a matter of time before it all comes together. When it comes to the headsets, the high-end ones (read: expensive) – the Oculus Rift, the HTC Vive – haven't changed much, if at all. But what has changed is the lower-end of the market. That lower end was occupied up until this point by headsets that used your mobile phone. By including your smartphone as a critical component, companies like Google with its Daydream and Samsung with its Gear have been able to put out a much cheaper headset with VR lenses and give people the experience at a very low cost. Except, it has never really worked very well. For one, as amazing as smartphones are, when you install them one inch from your face they are a little overwhelming. The screen resolution isn't good enough and the glare is too much. Not to mention the fact that your phone battery gets drained very quickly and the entire system tends to overheat because the phone is in a contained environment. The headphones also get tangled up. It seems that the industry has effectively abandoned that approach and now we have two standalone but low-end VR headsets: the Oculus Go and a new version of Daydream. They incorporate the screen and the speakers and the result is a much smoother experience without the irritations. They have handsets - well, little remote controls - that work quickly and easily. They are designed to have longer battery life, to not overheat, and having tested them out at GDC, they don't leave you with the sense that you need to fend off a headache (it might be a higher frame rate). Neither product is available right now (the Oculus Go stand had a little stand noting that it's not approved by the FCC yet either), and reps wouldn't be drawn on when they will hit the market. But Oculus/Facebook has said it will charge $199 for the Go – which is a remarkable good price for what you get. Here's the problem with both of these lower-end VR models however: they are still a little juddery. You have to turn you head to see around you, and you really need to be on a rotating chair to feel comfortable. But as humans, we aren't used to constantly turning around and turning our head – it's a little exhausting after a while. Google has tried to alleviate this issue by letting you slide your finger on its remote control and instantly shift your orientation to the left or right – which helps but that too is tiring and a little alien. The problem is less pronounced in the high-end headsets to the extent that it's more comfortable to be standing up and moving around when using them (you would probably fall over or get dizzy with the lower-end ones). But it wasn't until we tried a version of the HTC Vive with Tobii eye-tracking that we realized what the issue was. In fact, Tobii's system is probably the one thing more than any other that will turn VR from a niche market into something that everyone will be tempted to try out. Tobii's system – which can be integrated into a headset or mounted as an add-on (but integrated is better) – is really quite remarkable. Because when we interact with the world, we don't constantly move our head – we move our eyes. If you have a drink in front of you right now – to the left or right of your computer/phone – you will likely have just looked at it by glancing across at it, not by turning your head to directly stare at it. This is where VR is tiring. Equally, while the headsets that comes with the higher-end VR systems go to enormous lengths to look and feel like extensions of your hand (and to a large degree, work), the little remote controls that come with the lower-end systems are a pain. You have to constantly line them up; it's a little tedious. Oculus Go has tried to avoid this by moving the screen as you move your head. It works but it is not relaxing. The Tobii system changes this equation by tracking your eyes – to an almost weirdly accurate degree. Three demos highlighted how impactful this was. In one, you look into a mirror – and see an avatar that reflects your eyes and head movements back at you. On the left is the normal VR; on the right, Tobii's version of VR. 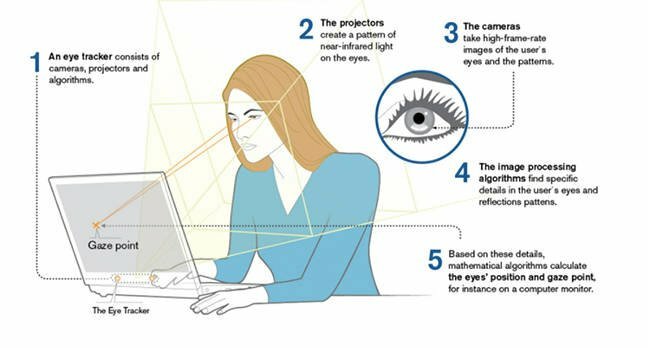 Eye-tracking, a diagram. You really have to experience it to understand the big shift it represents. The VR version feels like a computer game; the Tobii version is weirdly human. You feel like you actually achieve eye-contact. And it blinks when you blink. The possibilities here to make a really compelling game – or other VR content – are huge. Suddenly, you will be able to meaningfully connect in a human way to others – whether a computer generated organism or another player. The second demo will completely change how people play games. It comprised of a very simple game of picking up a rock and throwing it at bottles. No computer games actually work well in this scenario because it is very hard to measure your accuracy and force. Instead game developers cheat the system by giving you things like hyper-real gunsights that turn different colors and lock on to things. The Tobii system targets from what you look at. And it works. And the truth is, it was a lot of fun. It was very easy to imagine the game getting harder, with greater skill and accuracy required as you got used to it, but here was a game that your kids or parents could really get into. Another barrier gone. And the last demo had you use a traditional games controller to select an array of things – pointing, selecting – and then let you turn on eye-tracking and do the same. The difference was enormous: one felt natural; the other, stilted. The interface faded into the background and you got to simply enjoy what is in front of you. Based on those demos, it's hard to imagine any VR headset in future not incorporating eye tracking. And, according to Tobii's CEO, Henrik Eskilsson, it comes with an additional benefit: any areas that you aren't currently looking at don't need to rendered in as high a definition, saving on processing power. It works like the human eye. One last thing to do with perception and then the guns. Sounds, whether people realize it or not, plays a huge role in how comfortable you feel in a virtual environment. Typically games developers will use sound to cue you into action or changes – in the same way a movie does – to keep things dynamic. There's a noise to your left; an explosion to your back-right. But the truth is that it is often overdone, which is turn makes the whole experience feel overwhelming. Gamers love it; everyone else feels a bit ill.